RENA stands for Replicate and Enhance Natural Aesthetics. It is the Smile Stylist’s technique to create porcelain veneers and crowns that look like natural teeth. We are sought after for our ability to make porcelain veneers look like teeth. Working diligently with the highest quality materials and customized techniques that result in conservative treatments for life-like smile makeovers. We can consistently create porcelain margins at the gum line that are invisible and incisal edges of veneers that are translucent and full of natural effects that look like real teeth. Working diligently with the highest quality materials and customized techniques Smile Stylist provide result utilizing conservative treatments for life-like smile makeovers. We can consistently create porcelain margins at the gum line that are invisible and incisal edges of veneers that are translucent and full of natural effects that look like real teeth. Natural is in the details. Natural teeth are “Perfect”, they have certain attributes that make them beautiful. Studying a natural tooth reveals morphologies, macro and micro textures as well as enamel variations such as inclusions, halos and white or amber effects and more. Textures scatter light making teeth appear brighter, translucency gives teeth their natural depth and their warmth comes from deeper dentin layers. Inexpensive veneers and crowns made by dental technicians who are less experienced or technicians who are not compensated properly for their time do not not have the details to make them look natural. Smile Stylists know what teeth should look like and only use dental laboratories with technicians who are at an expert level. Leave the details to Smile Stylist! The pictures are taken close up with a non distracting background to be able to better critique our style of dentistry and decide for yourself if our level of care is up to your standards. This is an example of a set of porcelain veneers. Notice how you can not see the edges of the veneers at the gum lines and there is natural surface textures on the veneer. Teeth are rarely smooth, if they are, then it is typically a sign of wear. Teeth are born with beautiful surface variations making them look youthful. The key is to have just enough, but not too much! This is an example of a woman who had existing crowns on two front teeth. We did a smile makeover replacing the two crowns and doing porcelain veneers at the same time. We also preformed a laser gum lift to create more ideal gum heights. Notice how the light reflects off of the porcelain crowns and veneers. This is called surface morphology. 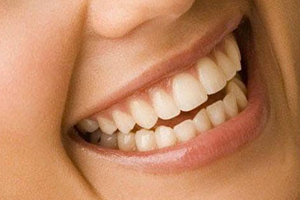 Natural teeth have surfaces that are not perfectly smooth across the whole tooth. This woman had old bonding that were replaced with porcelain veneers. Notice the deeper translucency at the biting edges of the veneers. The translucency is created in various depths, shapes and colors and is custom tailored to each patient. Less expensive veneers are available for dentists to purchase from dental labs, they are frequently created from one color of porcelain and externally stained. The highest quality porcelain crowns and veneers are made from one color, then the entire surface of the .5-.7 mm thick piece of porcelain is cut back and layered with different colors and translucencies of porcelain to create more life like results. It is difficult to find truly artistic ceramists who are capable of preforming this difficult task. Making a porcelain crown or veneer on a single central incisor match the other front teeth is commonly considered one of the toughest treatments in cosmetic dentistry. Frequently dentists decide to treat more than one tooth to help the porcelain match the other natural teeth. This is an example of one porcelain veneer that was preformed on a patient who had a dark front tooth. The porcelain veneer was used to lighten the tooth and create incisal translucency, surface morphology and shape that would blend in with the natural teeth. It is a good idea to make sure you get second opinions when considering cosmetic dentistry even if it is for the treatment of one tooth in the smile. This can be the trickiest most time consuming treatment a cosmetic dentist can preform. Porcelain veneers can correct spacing and crowding without the need to wear braces or clear aligners. This patient received porcelain veneers on the top and bottom teeth to close the space and correct the crowding. She also needed some cavities filled with porcelain fillings on the back teeth and we treated those teeth at the same time. This is the same patient from above showing a close up picture of the top and bottom teeth after receiving porcelain veneers. It is important to us that the porcelain veneers look like they are natural teeth growing from your gums. Even in situation where the patient has spacing and crowding, with proper techniques, materials and planning it is possible to make the veneers look natural. Many dentists shy away from doing porcelain veneers on lower teeth, they tell their patients that the treatment does not work for bottom teeth. It is always a good idea to get a second opinion when the suggested treatment is more aggressive than you think is necessary in your circumstances. Sometimes the opinion is based off of a dentists’ own personal experiences of what works in their office and not what the most experienced and educated cosmetic dentists are practicing. This patient had a crown on a front tooth and old fillings on the other front teeth. He wanted all his teeth to be the same color and he did not like that his two front teeth were so much larger than the other teeth in his smile. We replaced the crown with a new porcelain crown and did 7 other porcelain veneers to make all the teeth look the same color and improve the proportions of the front teeth. Men teeth should look different than a smile designed for a woman. The shapes are more masculine. Using the right materials and techniques enables us to pull some of the warmth from his natural teeth through the veneer at the gum line. This is important for people who show gums when they smile. A natural transition from veneer to natural tooth will prevent the “Fake” look that can be noticeable on people show more gums when they smile.